Whether we like it or not, our kids are always watching us. From their observances, they learn about how life works. And then they imitate us (for better and for worse). That’s why so many pretend play toys revolve around domestic chores. 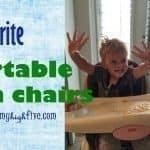 With children needing to eat three meals a day (Seriously, it’s the worst! ), one of the most common tasks a parent performs is cooking. 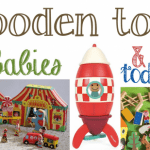 No wonder kids are so enamored with play food and toy kitchens! When looking for the perfect toy kitchen for your culinary-inclined kiddo, there are several factors to consider. First, how much space do you have? Toy kitchens come in all different sizes, so be sure to measure your space before making a purchase. Second, how much are you able to spend? 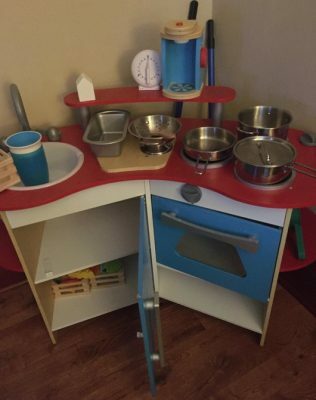 There is a toy kitchen out there for nearly any budget. Some can cost as much as a real kitchen appliance! 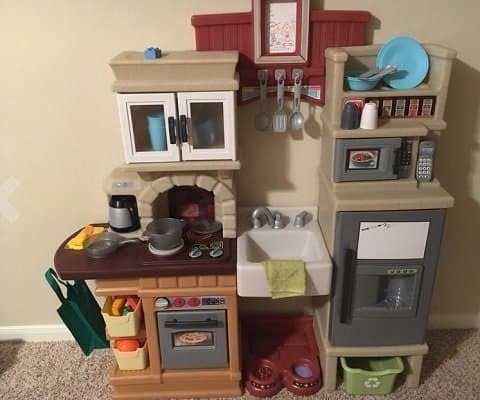 Thankfully, however, you don’t have to spend hundreds of dollars to get a play kitchen your child will love. All it really needs is some basic characteristics to provide hours of pretend cooking fun; a stovetop, an oven, a sink, and some storage space for keeping accessories is plenty. As with anything being used by kids, a toy kitchen needs to be made of quality materials. 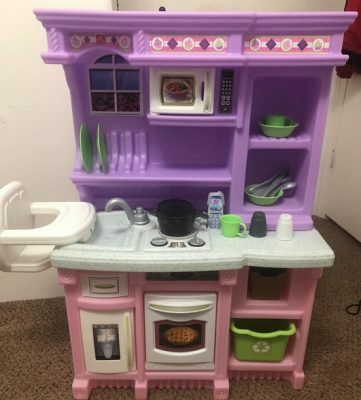 We once bought a really cheap plastic kitchen for our daughter when she was two, and we had to throw it away a year later. It simply didn’t hold up to our (admittedly destructive) toddler. Wood or Plastic for a Play Kitchen? The other big consideration when purchasing a toy kitchen is what material you want it to be made of–plastic or wood. You can find a quality play kitchen in either material; it really just depends on your preference. Plastic kitchens are more lightweight, are faster to put together, and can often be less expensive. Wood kitchens tend to look a little nicer and are a more sturdy, durable option. If a play kitchen is on your kid’s wish list, you’re sure to find the right one among these 10 great options. This sweet, colorful play kitchen is perfect for your littlest aspiring baker. In addition to the kitchen itself, this set comes with several fun accessories, making it an even better deal for an already great price. Your toddler aged child will love playing with the spatula, pot and lid, cupcake tray, four cupcakes, two spice shakers, and complete dining set for two. 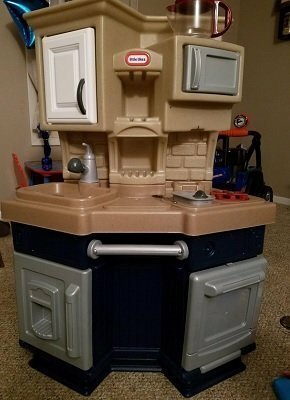 If space or money is an issue, this Little Tikes kitchen can’t be beat. At 33.5 ” tall by 24″ wide by 11″ deep, it’s still a decent size and even includes a sink, a working drawer, decent storage space, and two burners that make a clicking noise when turned. 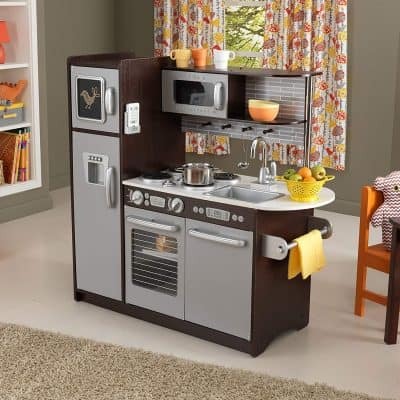 This compact little kitchen can either be placed in the corner of the room or against a wall, making it a great, versatile option for 5-year-old. Measuring 40″ tall by 28″ wide by 14″ deep, it includes the typical features of a microwave, single burner stove, oven, refrigerator with ice dispenser, and sink. In addition to those, it has such details as a towel bar, a built-in countertop cutting board, a coffee pot, slots for storing plates, and a storage cupboard. 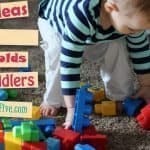 Place settings for two, a frying pan, and a phone are also included for easier imaginative play. The knob above the oven also makes a clicking noise when turned, and the burner makes sizzling sounds. 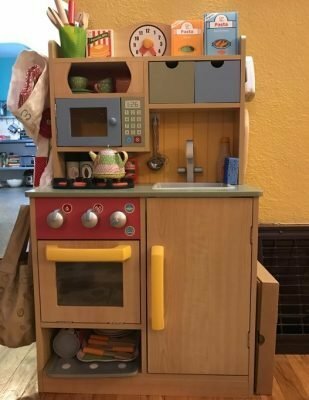 With this play kitchen’s design, there is a place for everything so that your 3-year-old child can have everything in its place. There is a designated spot for the phone, a cubby for the recycling bin, a nook for the storage basket, and slots for the plates. There is also ample storage for the pot and pan, utensils, bowls, cups, and other accessories that are included in the set. 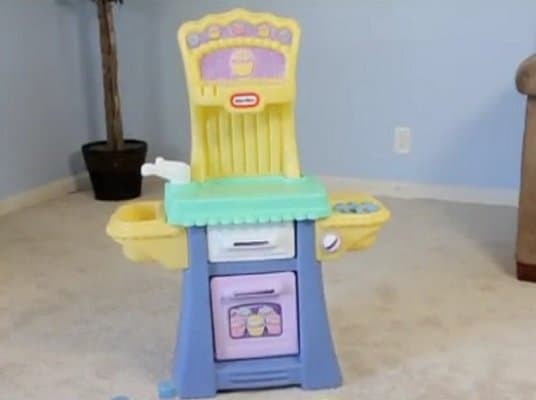 The most unique feature of this play kitchen, however, is the built-in high chair next to the sink so that your child’s favorite doll or stuffed animal can keep her company as she plays. It adds another layer to the pretend play fun! There are also engaging lights and sounds–either frying or boiling–that emanate from one of the two burners when using the pot and pan. This play kitchen is the gold standard of plastic play kitchens. At 48″ tall by 45.1″ wide by 12″ deep, it can accommodate a couple of children at one time and is tall enough for bigger kids. Its realistic design includes a farmhouse sink, a refrigerator with ice dispenser, a coffee pot spot, over-the-stove cupboard storage, a dry-erase board on the refrigerator door, a recycling bin, and a designated spot for a pet’s food and water bowls. There’s also a place to hang a reusable grocery bag, which is included in the kitchen set, along with a hand towel, a couple of pots, two place settings, cooking utensils, and salt and pepper shakers. A built-in photo frame above the sink can be filled with a favorite family photo and changed out regularly for a unique, homey touch. In addition to the appealing sights are the fun, realistic sounds that come from the phone, which beeps, and the two-burner stove, which makes either a boiling or frying sound depending on which pan you use. These kitchens are great for young kids because they are made out of safely painted and treated wood. This solid-wood kitchen boasts a classic, simple design that consists of mostly natural wood with a few painted surfaces. It has a two-shelf oven for baking up tasty pretend treats, two burners, and three hooks for hanging accessories. The sink, while shallow at only 1/2″ deep, is painted to look as if it is full of water. 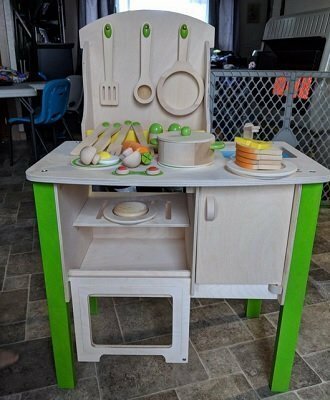 The best thing about this play kitchen set is that, unlike other wooden kitchens, it includes several accessories–plates, forks, knives, a pot, a pan, two cooking utensils, and several different play foods. For a wood kitchen, the assembly is actually pretty simple, and the package includes everything you need to put it together. The finished product measures 31.1″ tall by 21.3″ wide by 11.8″ deep. This retro-inspired, compact toy kitchen from beloved toy makers Melissa & Doug features bold, classic colors to draw the eye and simple details to stir up (hah, a cooking pun!) 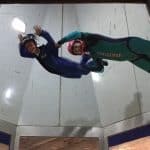 your child’s excitement. In its smaller frame–26″ tall by 37″ wide by 16.5″ deep, to be precise–it manages to fit in three burners, an oven, a small sink, a miniature refrigerator/extra cabinet, and a countertop cutting board. Measuring 42.9″ tall by 42.2″ wide by 16.2″ deep, this is the largest play kitchen on our list, making it a great option for families with multiple children interested in playing with it. At such a large size, this kitchen is able to include a dishwasher, freezer, and refrigerator–with a shelf the middle–in addition to the more commonly included stove, oven, microwave, and sink. The stovetop boasts four incredibly realistic-looking coil burners, and the oven has two levels. Both the microwave and oven have see-through plastic doors for a more realistic look. And like most play kitchens, the knobs make clicking noises when turned. Finally, this set comes with two cooking utensils and a hot pad, along with places to hang them. The bright colors of this kitchen make it a fun addition to any bedroom or play space. This cute little kitchen is a more affordable wood option than many of the others, and its price is reflected in its smaller size. Standing 35.50″ tall by 21.50″ wide by 11.63″ deep, it comes with a fold-down oven, a decent-sized storage cabinet, two small burners, a sink, and a microwave. There are also several shelves and cubbies for storing play food and cookware. Made from eco-friendly MDF and minimally painted with lead-free paint, this play kitchen only takes about 30 minutes to assemble. In addition to the kitchen itself, the package comes with three different spice containers, a spatula, two pull-out storage boxes, and a phone. For extra fun, the oven and stove knobs click when turned, and a clock at the very top provides further opportunities for imaginative play and learning. 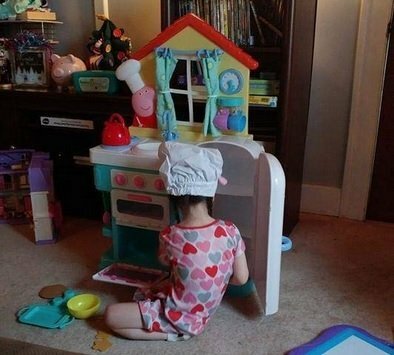 If realistic-looking features are a high priority, this is the toy kitchen for you. It is by far the most classy of the kitchens on our list, and its many features don’t disappoint. The microwave has a turntable that rotates 360 degrees, and the oven has a drawer that slides in and out. Your child will like that the refrigerator has a pretend ice dispensing slot on the outside and a shelf on the inside. With a real chalkboard on the outside of the freezer and four realistic-looking coil burners on the stove, this kitchen will seem like a real kitchen to your kiddo. The sink has a modern-style faucet with a working handle. While this kitchen doesn’t include any accessories, it does boast a cordless phone, paper towel holder, and four pegs for hanging any cooking utensils or pot holders you buy yourself. In addition, the knobs for the oven and stove make a clicking sound when turned, and both the oven and microwave have see-through plastic windows rather than stickers. At 41″ tall by 42.5″ wide by 17.1″ deep, this kitchen is large enough for more than one child to play at once. It is made of composite wood, molded plastic, and a few metal pieces. Whether your 4-year-old child is a fan of Peppa Pig or not, he’s sure to love this adorable, colorful play kitchen. 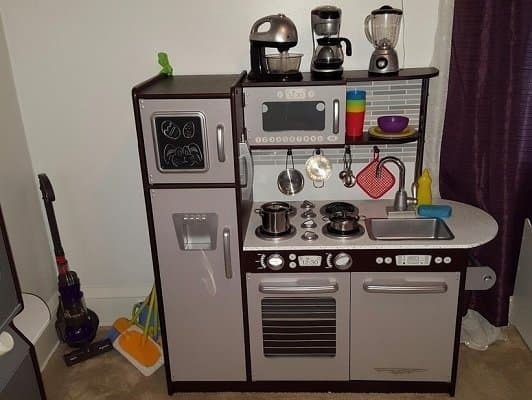 With two burners, a double oven, a refrigerator, and a sink, it has everything your child needs to create a culinary masterpiece and clean up the mess after. As icing on the cake, this 37″ tall by 22″ wide by 12.5″ deep kitchen includes a whistling teapot, a sizzling frying pan (which also has a pancake flipping mechanism), and a faucet that makes realistic water sounds. The refrigerator has several shelves inside for storing food, and the oven even has a light! 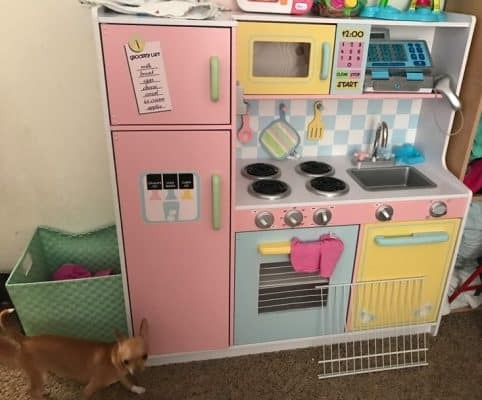 With fun details like a clock and a window with curtains, and with lots of fun accessories–a chef’s hat, an oven mitt, star-shaped pancakes, a tray, a bowl, cooking utensils, a cupcake pan, and cupcakes–this little kitchen is sure to provide hours of fun.